Catnip, catmint, catwort, field balm — it doesn’t matter what you call it. Lions, tigers, panthers, and your common domestic tabby just can’t seem to get enough of this fragrant herb.Originally from Europe and Asia, minty, lemony, potent catnip — Nepeta cataria — has long been associated with cats. Even its Latin-derived cataria means “of a cat.” And research shows that cats big and small adore this weedy, invasive member of the mint family. But why do they like catnip so much? Is it safe? And what does it mean if your cat doesn’t like it? It’s genetics that determines whether your feline friend falls for this cousin to basil and oregano. About one cat in two inherits a sensitivity to the herb. But you won’t know if your kitten is one of them until sometime between ages 3 and 6 months. Catnip’s allure is in its volatile oil, specifically one chemical in that oil — nepetalactone. Found in catnip’s leaves, stems, and seeds, it only takes one or two sniffs of that wondrous oil before susceptible felines are licking, chewing, and rolling head-over-tail in kitty bliss. Though intense, that bliss is usually short-lived, lasting about 10 minutes for most cats. For some, the euphoria translates into aggressive playfulness. At the same time, it makes others mellow and calm. But no matter what reaction your cat has, once the pleasure passes it’ll be about two hours before kitty responds to catnip again. Want to keep kitty from clawing furniture? Rub a scratching post with catnip to make it more appealing. Bought a new cat bed? Sprinkle a little of the herb on kitty’s cushion to make it more attractive to your feline friend. The intensity of kitty’s response to toys and training will be affected by the type of catnip you use. 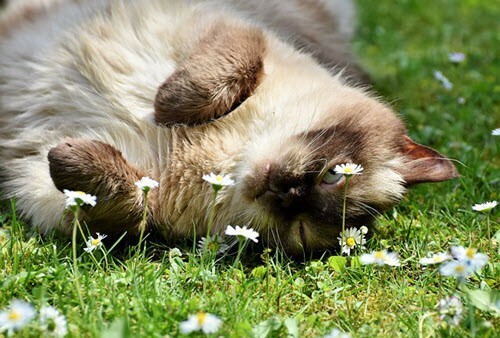 While most cats enjoy the herb dried or fresh, they’re usually less interested in catnip sprays, which generally don’t contain enough nepetalactone to appeal to most felines. Fortunately for kitty, catnip — which is non-addictive and safe to eat — is easy to grow in a sunny window. You can even go so far as to create your own kitty garden with one pot of catnip and one of wheat, oat, rye, or barley grass. Not only will kitty enjoy both, but having its own house plants may keep kitty out of yours. If you plant catnip directly in the garden, remember that, like most mints, it’s a vigorous, sometimes invasive, grower. Catnip’s potency doesn’t last forever; the essential oils quickly dissipate. So if you buy dried catnip for your feline friend, store what you don’t use in the freezer.